For the past 7 years visitors to the Edmonton Valley Zoo have been getting closer to Red Pandas — some of nature's most endearing animals. Since their arrival from the Tokuyama Zoo in Japan, our red panda's Koko and Lala have warmed the hearts of zoo guests of all ages and helped us understand more about these special animals. Red Pandas are classified as vulnerable by International Union for Conservation of Nature and Natural Resources (ICUN) because its population is estimated at fewer than 10,000 mature individuals. The Edmonton Valley Zoo Red Pandas are now an important part of the Species Survival Plan (SSP). Being unrelated to other Red Pandas in North America, their genes the most valuable within the population. The Edmonton Valley Zoo animal care team was hopeful that the pair would breed and eagerly awaited Lala's first set of cubs. The breeding season for Red Pandas is from January to March. The fact that they have delayed implantation (making the reproduction period between 90-120 days) made it difficult to predict when cubs could be expected. When initial efforts were not successful, the team decided to increase our knowledge in Red Panda husbandry and breeding and contacted several zoos and the SSP coordinator for advice. From the rigorous research the team undertook, the Edmonton Valley Zoo pioneered new improved standards of care. When zoo staff realized that Lala was due to give birth, countless hours were spent watching footage from cameras installed in the habitat. Staff worked to note any unusual behaviours. Eventually a little cub was born. Lala would lick and cuddle her light coloured baby, and it appeared that she was going to be a good mother. However, Lala soon started to over groom the cub and not let it nurse. Just as the care team prepared to intervene and take the baby for hand-raising from Lala, she suddenly turned on the baby. The team was moments too late to save the cub. Realizing that Lala was not a good mother, the decision was made to hand raise any babies she would have in the future. Since then, the zoo's care team has been successful in raising 6 offspring in the last four years. These Red Pandas now live in various zoos across North America and are adding their valuable genetics to the population. Through these efforts, the Edmonton Valley Zoo has educated thousands of zoo guests to the plight of these animals by allowing them an up close view through encounters and interpretive talks. The knowledge gained has allowed us to become recognized in the SSP community as an expert in Red Panda husbandry. In order to expand on that knowledge and expertise, the Edmonton Valley Zoo has taken up the cause to protect and conserve these animals in their native habitat. To reach our conservation goals, a fund raising initiative is being developed not only to reach zoo visitors, but also to partner with Zoo School to help raise awareness amongst children. 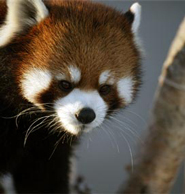 The donations received from the campaign will be administered by the Red Panda Network, a non-profit organization dedicated to saving the Panda's habitat and educating the people of Nepal. The Edmonton Valley Zoo looks forward to working with this organization for the next several years and to also create a greater awareness and appreciation for Red Pandas and their habitat amongst our visitors. Donations are graciously accepted and can be made by contacting the Edmonton Valley Zoo at 780-496-7396.